It’s a gas, a hit and a crime. It changes everything, can’t buy you love and affluent people, men in particular, find it amusing according to 1970’s pop superstars. A squillion songs, poems, novels, and adages have been penned about it, an equal amount of lives lost due to its lack or excess, and people will be televised doing unbelievable things to get their hands on a bit more. 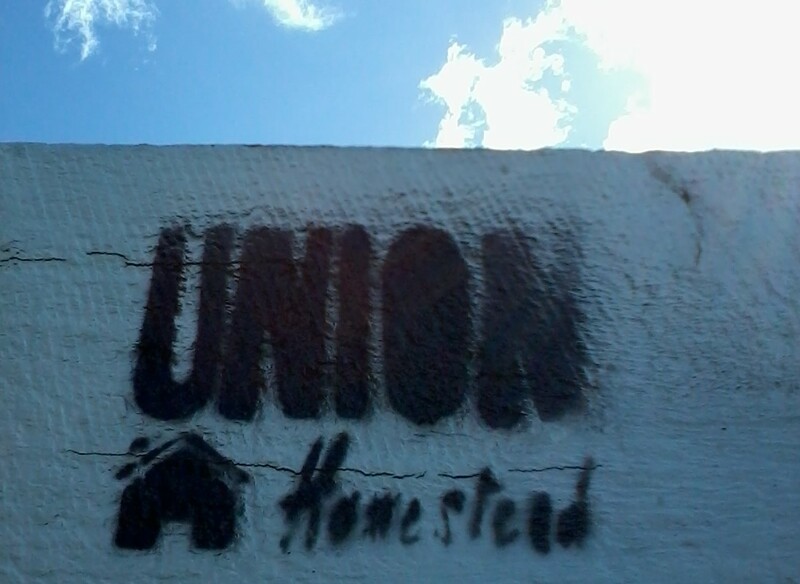 It’s a blessing, a curse or, as we Homesteaders see it, something in between. Money, we reckon, is a necessary evil. Don’t get us wrong, we’re well aware that moneyless societies are existing, even thriving, throughout the world. Englishman Mark Boyle lived for a whole year without the stuff, for example, and although the cynical among us may point to the resultant books, public appearances and general notoriety which usually translates to a pile of dosh, he still managed to stay healthy, happy and sane for those 365 days. It’s been said before that here on the Homestead we’re in the “wanting our cake and to eat it too” camp, an observation that carries a a fair smidgen of the truth. It’s our desire to own a patch of land, hang out in cafes, partake in the education, health and infrastructure benefits afforded taxpayers, and indulge in our “Good Life” aspirations while still being connected to “the real world” that means that we will never be able to do a Mark Boyle. At the end of the day, we still want to be able to take a couple of books out of the library or pop into Crema for a coffee; try doing either of those without a valid address or a couple of coins in your pocket. But as for the whole “I’m all right Jack, keep your hands of my stack”, judging someone by their address, the car they drive, their clothes label or the kind of gizmo they text on? Count us out. There’s got to be more to it all. This introspection has been prompted by three recent events. The first was documented in last week’s missive Ed: Our Main Man: the acquisition of a item someone else saw as utterly useless. So useless, in fact, that (we have since learnt) they ditched it in the dead of night (along with a munted sofa, two tyres and a nasty looking mattress) outside someone else’s house. 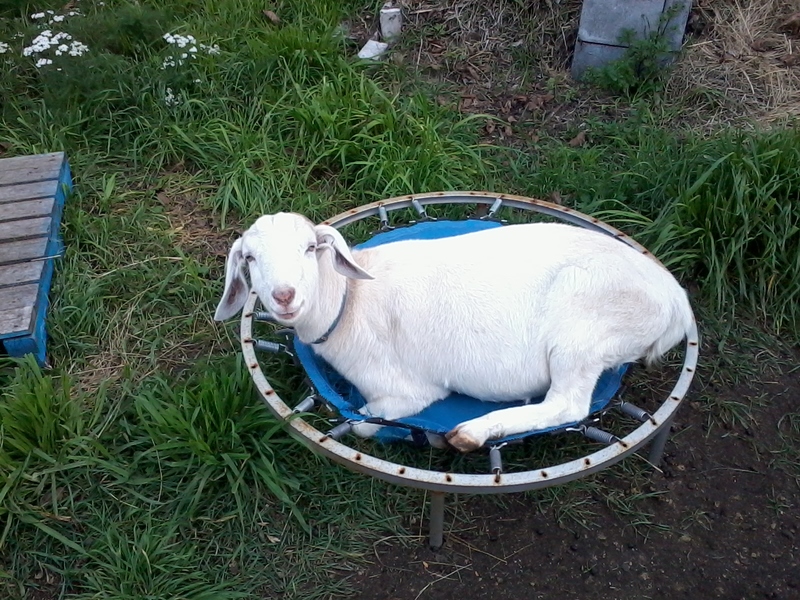 Yep, I’m talking about the goat trampoline. What we’re rather clumsily trying to say is that things don’t need to cost a mint or be perfect to bring joy. It’s a concept that could save a fair bit of both landfill space and financial stress. The second cue for this contemplation of the filthy lucre was the fulfillment of a barter arrangement that saw The Goat Herd and Milk Maid playing Pork Tetris in the new freezer yesterday. In Up and Running Again we told you of our giving our very basic labour in building a cow shelter. In return we were offered a pig; we even got to see said it gambling in porcine bliss alongside it’s little piggy siblings. At the time it seemed like a slightly unfair agreement: hanging out with people whose company we enjoy in return for more meat than we’ve seen for…well, maybe forever. When we finally got the call that it was ready and would be delivered, the enormity of the perceived lack of balance accelerated our misgivings to a state of very real anguish. Could we not pay for the transferal of pig to packaged meat? Or pick the final product up? Or…or…or…? The Glamour Hippy was very patient in explaining the art of bartering to us. It’s actually pretty basic and we’re a bit embarrassed we were so tardy on the uptake. You see, when you barter it needn’t be arduous. Why should it, as it’s just a swapping of something you have in abundance (in our case willing hands) for something someone else has (the makings of a great many happy breakfasts, lunches and dinners). It’s a win win. Okay, we know we have. In a nutshell for those who have only just caught up with us in this realm, our gorgeous suburb has been pretty trashed by a variety of things including a couple of earthquakes (catch up on the details here) and there’s no money left in the coffers, even those coffers that had our name on them. In the spirit of realisation that no one was going to wave a magic wand SURF New Brighton was born. So, back to bartering. One of our favourite places in the world, Pierside Bar and Cafe, offered a deal: you buy into changing your community and we’ll give you a meal. Okay, it was a bit more intricate than that involving vouchers and stuff but that was a general gist and at the end of it all we had a pretty awesome Sunday lunch and SURF got some dollars to do something that can only be done with money. Because sometimes that’s the only way to pay. So while we can never imagine the Homestead being in a position to give up partaking in the exchange of moolah in our day to day life, we’re sold (ahem) on this bartering system. Have we got something in abundance that you could use? Just let us know. This entry was posted in Family, Goats, Union Homestead and tagged barter, bartering, Change our world in 28 days, Coffee, Community, finance, First world problems, Goat, goat on a trampoline, goats, Mark Boyle, money, moneyless society, society, Strategic Urban Renewal Force, SURF New Brighton. Bookmark the permalink. 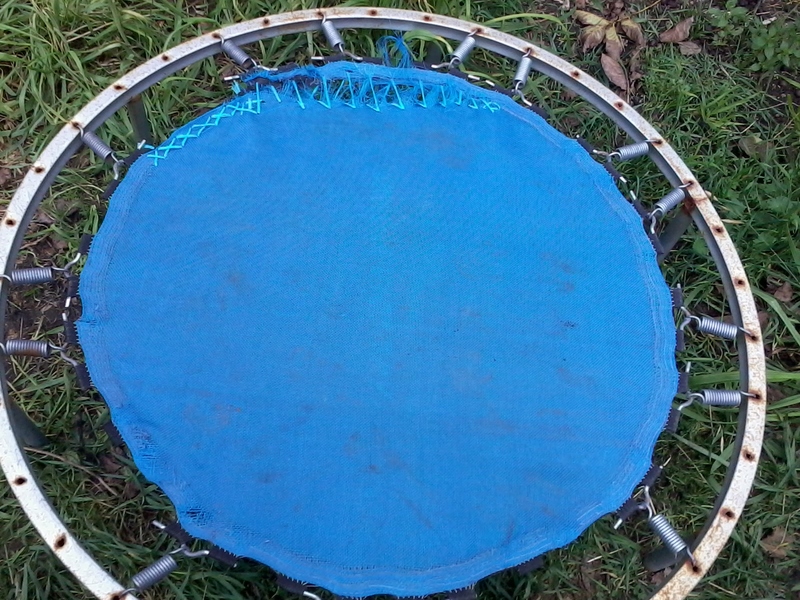 The goat trampoline looks like a lot of fun.